World Machine Software – aka developer Stephen Schmitt – has released World Machine 3025 ‘Alpine Lakes’, the latest version of the terrain-generation tool. 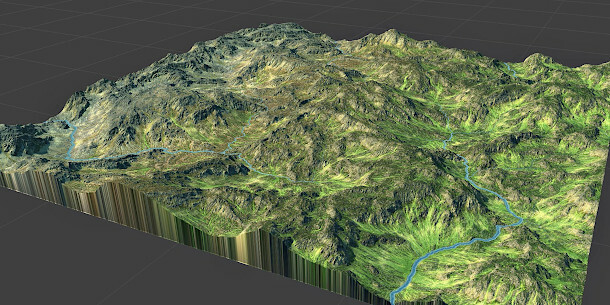 The release, which is on show at GDC 2019 this week, adds new functionality for sculpting and texturing terrain based on water flow, including the option to generate rivers and lakes automatically. For texturing work, the new Wetness Selector calculates the available moisture at any point on a terrain, based on rainfall – which can itself be driven by a map or gradient – and surface flow. Its output can be used to set the surface colour of the terrain, either manually or via a new Quick Texture macro, with wetter parts appearing greener. A terrain driven by a rainfall gradient, becoming wetter from left to right across the image. 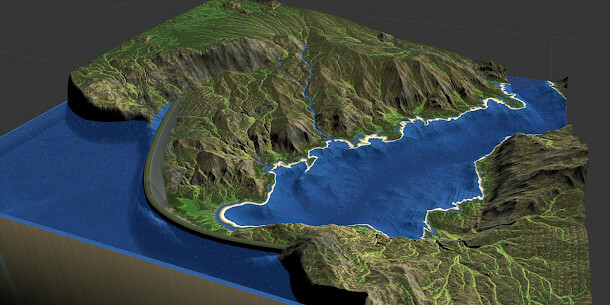 World Machine can also now generate rivers and lakes automatically based on the form of the underlying terrain, rather than users having to create them manually. The Create Water device causes streams to appear in upland areas above a user-specified wetness threshold, then flow downhill and merge naturally. A separate Flow Restructure device enables users to modify the results, including the options to force water to flow to the edges of a map, or to manually drawn rivers. The device also features an experimental synthesis mode, which mimics the effect of water erosion on terrain without having to run a full erosion simulation. There are also supporting changes to the existing manual River and Coastal Erosion devices, and to terrain export, including the option to export watertight volumes as well as surfaces. World Machine 3025 is available for Windows 7+. An Indie licence, which enables you to build terrains on two CPU cores, costs $119. A Professional licence – which raises the limit to 256 CPU cores, and adds tiled terrains and scripting support – costs $299, while a Studio Site Licence costs $1,999. The free Basic edition has all of the features from the Indie edition, but is only licensed for non-commercial use and makes it impossible to build or output a terrain larger than 513 x 513px.